Top Quality, Low Prices, 100% Feminized - What more do you need? Like most success stories, Vision Seeds started small and grew as they gained experience. When they first opened the doors of their Dutch cannabis seed shop in 1995, they were a simple reseller with one big difference: Vision Seeds always tried before they sold to ensure top quality. This little step (that many others skip) is what Vision Seeds is all about. After evaluating hundreds of strains, this high-minded crew learned every facet of the cannabis seed trade including everything from basic genetics to the best overall smoke experience. Plus, they understand that the average stoner isn\'t made of money. The Vision Seeds mantra is quality seeds at a fair price every single time! What started with a dream has culminated into the best collection of proven, 100% feminized seeds that today\'s market has to offer. 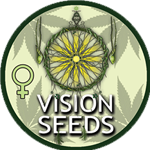 If you\'re looking for a strain with a successful track record and a 5-star standing with every major cannabis publication, go with authentic Vision Seeds! The Vision Seeds brand includes an impressive array of traditional feminized seeds as well as the most advanced, fully autoflowering strains. And, you\'ll instantly recognize each and every name in this stunning collection.